On a warm spring night, it’s hard to deny the appeal of an artfully crafted ice cream sundae. Whether it’s a banana split or peppermint chip drizzled with hot fudge and peanuts, it’s a mouthwatering sight to behold. And when it’s first made, all of the ingredients can be seen clearly in their places. But wait twenty minutes before eating it and it becomes a gooey conglomeration, difficult to distinguish the ice creams from the toppings. Strategic insights act in the same way. When you have a great new insight on your market, customers, competitors or own company, it stands out from all of the other information and data. At least for a moment. If we have the foresight to capture the insight in writing or perhaps with an audio recorder, we’ve taken an important step. If we don’t, the insight melts away into the ocean of other information that flows on by. Unfortunately, many managers don’t make that step. Data in The Economist article “Too Much Buzz” shows that 62% of workers report that “…the quality of what they do is hampered because they cannot make sense of the data they already have.” And the amount of data is predicted to grow more than 40 times by 2020. 1. 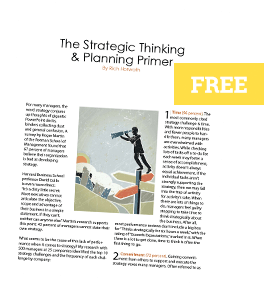 Think–Carve out think time and utilize one or more of the 40 strategic thinking tools to generate insights. 2. Record–Find a convenient channel for recording the insights, whether it be on your smart phone, day planner or other outlet. 3. Categorize–Begin to categorize your insights by topic area: market, customer, etc. Then review the categories for trends or patterns and look across categories to connect the dots in your thinking. If your business is suffering from no growth or only marginal growth, there’s a good chance a lack of insights is part of the trouble. No new insights means no new ideas, no new products and no new value for customers. Strategic insights can increase your business dramatically. The strategic thinking that will generate insights requires time, tools and discipline. So, get out your favorite ice cream spoon and start digging, before the business melts away before your eyes.